Thanks are due to Frank Hughes for filling a vacant slot in the SRS calendar on Saturday December 19. The rendezvous point was Ott Car Park and despite the short notice, 12 walkers gathered. Everyone savoured the first dry Saturday for some weeks, although overnight rain had left the ground pretty soggy. En route to the start, we had noted that Spelga Dam was spilling over, while all the streams had turned into torrents. 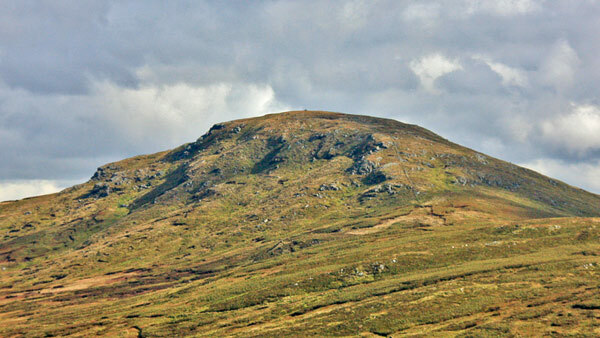 summitwas climbed, sheltered from the wind on the north side of Doan. Then as time marched on, we headed downhill and across the peat hags to a path leading up to the wall again. The various streams were all successfully negotiated although some skill was needed to use the stepping stones. Back at the cars by 3.30pm and on the road just as the sky darkened and a cloudburst enveloped the view. Thanks to Franks for being such a caring and attentive leader and for helping us get a breath of fresh air and a bit of exercise prior to the excesses of Christmas. Hard hats and radios all round for the Gobbins visit - the Edwardian path has reopened after a mulit-million pound renovation. Amazing feats of engineering and spectacular coastal views. All attendees managed to get to the start 20 mins early, despite the roadworks and diversions on route; after briefing from our guide, Robert, it was on and down to the path learning about the flora, fauna, geology and history of the area - a fascinating morning; after 2 hours exploring the path and then lunch in the visitors center cafe most of the 14 strong group were ready to face Christmas shopping; 4 of us squeezed in an extra walk with the coastal loop from Whitehead to Blackhead lighthouse in winter sun. The weather was mild but with cloud sitting on the top of Slieve Foy. 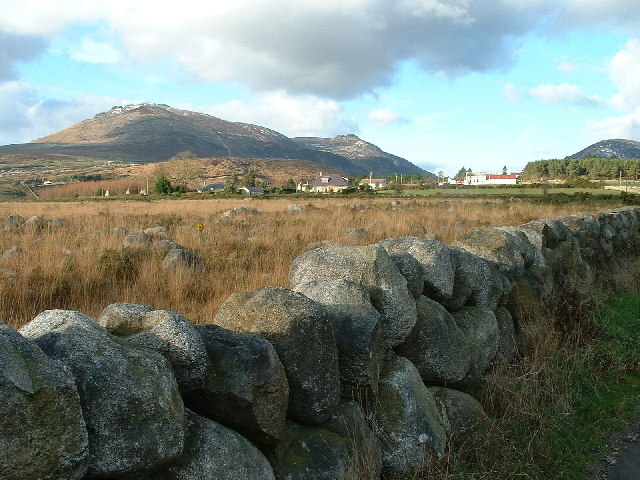 Seventeen members left the village of Carlingford and walked to the northern end of the forest path before ascending to the top of the ridge. As we stopped for lunch, the clouds broke and we enjoyed the surrounding views of Carlingford Lough and the Mournes beyond and out to Dundalk Bay and beyond. We descended back into the "Halloween bedecked" Carlingford by 5.30pm and most of the group enjoyed dinner together in PJs. Thank you David and Rachel. ​Glorious sunshine accompanied 16 Spartans on a walk over 4 mountains: Pigeon Rock, Slievemoughanmore, Eagle and Slievemageogh. The experience was enhanced by good company and spectacular scenery. About 15 Spartans enjoyed sunshine on our walk from Carrick Little and along the Annalong Valley to Blue Lough and ascending to the North Torr of Binnian from the saddle with Lamagan. We descended via the wall and some of us enjoyed refreshments afterwards in Newcastle. There was a large group of 19+ members present for the walks on our trip to north Donegal. We were staying in the Rosguil peninsula - near Downings. On Saturday we completed a great coastal walk from Tra na Rossan strand to just west of Melmore Hill. The weather was mostly sunny with some showers but the visibility was good and we got to see great views of the surrounding headlands and coves and Tory Island beyond. The following day, we completed a circular ascent of Muckish from the shrine on the pass at Gleenaneor and descending the western spur near Ballyboe mountain. Unfortunately the cloud cover on top meant that we only got to enjoy glimpses of the surrounding scenery - but a great day was enjoyed by all. We dined out on Sunday evening at the Bay Hotel in Downings. cycling around part of the Atlantic Drive. A great weekend was enjoyed by all. 18 walkers turned up a lovely walk around the less walked area of spalga and craigdoo mountains. Thanks to the good offices of Ken Bradley, SRS was invited to join forces with Northern Ireland Civil Service Ramblers for a walk on Saturday August 8, a date which had been blank on our calendar. Six Spartans set their alarm clocks for the earlier start time of 10am at Meelmore Lodge and were rewarded by one of those magically sunny and still mornings which have been all too rare this summer. We joined forces with a dozen of Ken's regulars for a nine-mile walk which NICS Ramblers rated as B but felt to us rather more like an A! From Meelmore Lodge we passed the camping field noting an abundance of tents and families sitting outside in the sun enjoying a late breakfast. But we were bound for the hills and our first challenge was Spellack, which is always a stiff ascent, involving a bit a scramble up a gully. After a pause at the top to gather ourselves we continued on up the well worn path to Meelmore (708m), where a first lunch was called. Sadly the weather had by now gone off the boil, and it was cloudy with a pretty stiff breeze. Still, we still had the benefit of good views across the hills. As we chatted, we discovered that a couple of the NICS regulars had participated in the SRS 7X7 event the previous Saturday and had thoroughly enjoyed it. The results, incidentally, are featured on the SRS website. and Carn. Second lunch was called here and we enjoyed good chat and company with our new friends from NICS Ramblers. Next up was Doan (594m) and we separated into two groups - one to tackle the south face and the other to tackle the north face. We met up at the summit, enjoying some panoramic views over the higher peaks but by this stage most were shrouded in low cloud. aircraft passing overhead. After a short break, we crossed the wall to begin our descent, contouring round the lower reaches of Meelmore and Spellack and then over the stile to Meelmore Lodge, which we reached at 4.50pm. At present the premises are being redeveloped but we were still able to organise a cup of coffee before heading home. Many thanks to Ken Bradley and all concerned at NICS Ramblers for making the SRS participants feel so welcome. It was interesting to sample a walk with another group and hopefully there will be opportunities in the future for further collaboration. Despite the prediction from BBC forecaster Geoff Maskell that it would be a "usable day", and a bright start as seven Spartans gathered at Ott car park, the weather went off the boil at lunchtime. With leader Marie Doran setting a steady pace, we had crossed the wall and reached the summit of Doan in an impressive 75 minutes. But as we settled down to partake of first lunch the cloud lowered and the mist which had already encircled the higher peaks descended to our level, blanking out the view. Shortly afterwards a thin mizzle enveloped us and Marie wisely decided to abort the original plan to cover Ben Crom. And so we descended in a brisk wind to a path which led us across the contour above the grey waters of Lough Shanagh and up to the saddle again. At least we were below the mist so we did get some nice views down over the lake. The very acceptable Plan B involved an ascent of Loughshanagh mountain, where it was rather too windy for a sit-down. And so we descended part way down the slope and found a more sheltered spot for second lunch. factor was that it was still relatively warm, but the main aim was still to make our way down to the car park and the waiting cars. boots had kept us all dry - as Marie said, a sound test for walkers and equipment. Of course as soon as we were back in the cars and beyond Hilltown, the day did turn out to be as usable as Geoff had predicted. But that is mountain weather for you - even in July! And fair weather never made a good sailor - or a seasoned Spartan! 19 Spartans gathered at the fabulous and convenient facilities of Benbaun House a short hop from Clifden town centre on Saturday 11 July for the annual week long summer trip. The walk programme was ably led by David Wiggins, Richard and Henry to whom we owe many thanks. Sunday saw a group tackle the Benchoona Horseshoe (Benchoona, Garraun and Altnagaighera) and a walk along Killary Harbour with a higher level return to the cars giving splendid panoramic views over the lakes, mountains and coastline with a stop at Paddy Coynes at Tully Cross our post walk reward. A walk along a stretch of the Western Way from Lough Inagh to Leenaun was our main walk on Tuesday, again relaxing afterwards in Gaynor’s pub in Leenaun. Wednesday was the best day of the week weather-wise and full advantage was taken with the great scenic walk of the Ben Lettery horeshoe (Ben Lettery, Ben Gower and Ben Glensky). The weather held for an enjoyable BBQ that evening. arranged this day with folks heading off for various activities including cycling, sightseeing, yoga and shopping. stopping for coffee and scones in the plush surroundings of Ballynahinch Castle Hotel. The final night saw the usual night off cooking with an excellent meal at the Marconi Restaurant at Foyle’s Hotel in Clifden. We ate like kings all week - many thanks to all who contributed to buying food, cooking, washing up etc. No responsibility can be taken for any increase in waistlines!! The weather at Meelmore Lodge was very misty and with strong winds - so we weren't sure how much of the planned route of Meelbeg, Meelmore and Bearnagh we would complete. We decided to just ascend the Happy Valley to the saddle between Meelmore and Meelbeg and by that time the predicted improvement to the weather had happened and our group of 13 members enjoyed terrific views for the rest of the day. A beautiful early Summer's day on Rathlin Island with a walk to the West Lighthouse from Church Bay and back. The island was looking at it's best with beautiful green fields and hedges and lots of wild flowers, butterflies and birds. The nesting sea birds at the West Lighthouse were as spectacular as usual. We returned to Ballycastle and dined in The Marine Hotel. Thank you to David and Rachel for a great day out. Fourteen of the group gathered at The Spires self-catering accomodation outside the small town of Stradbally - south of Portlaoise, Co Laois. You may have heard of Stradbally as the nearby Stradbally Hall hosts the annual Electric Picnic Music Festival each August. On Saturday we went to Glenbarrow - the source of the River Barrow, the second longest river in Ireland. The Barrow is one of the three sisters with the River Nore and the River Suir making up the others. The Barrow enters the sea in Waterford, 120 miles away.Glenbarrow is one of the most scenic parts of the Slieve Bloom area with its waterfalls and steep valley. The area is very remote and offers the visitor peace and tranquillity. wide plains of central Ireland all around. A cuckoo sang from the nearby valley. Our descent back to our starting point took us near the Metal Man and along a succession of paths and through the most beautiful wood - the floor of which was carpeted in bluebells which gave off the most beautiful scent. the Slieve Bloom mountains are named. Our walk took us through forested paths and riverbanks until we arrived at our destination near the village of Kinitty and enjoyed a well-earned beverage before our return back to our accomodation. That evening we dined in Portlaoise. Our return home on Monday took in the nearby Rock of Dunamase - a rocky outcrop where the ruins of Dunamase Castle, a defensive stronghold dating from the early Hiberno-Norman period are to be found. Thanks to Joan and Jim for organising a very enjoyable weekend. The weather, company and craic were great - as usual. There were 10 in the group that set off from Cushendun on Saturday. The weather was a mixture of bright intervals and quite wintry showers - some with hail and strong north west winds. Because of the cooler temperatures and the showers, we walked at a reasonable pace and took our first tea break in the little copse of trees by the drover's path and just before our ascent towards Carnanmore. The most powerful shower of the day arrived as we ascended to Carnanmore. The only blessing was that the strong wind accompanying it was at our back. We rested by the cairned burial chamber at Carnanmore and headed north west to the derelict buildings at 215405. The weather seemed to improve later and there were very few showers - although the wind remained quite strong. We soon had views of Murlough Bay and the profile of Fairhead. We could see the Mull of Kintyre in the distance - looking a little hazy and that haze meant that we could not sight the islands of Jura and Isla. precipitous gorge to the rocks and the boiling sea below. We soon descended Fairhead and we could see at close quarters the power of the waves on such an elemental day. around 7.10pm) - it still took us over an hour to reach the town and enjoy a meal from the chip shop there, that has become a little pleasure of this walk. A long day - with great views and company and only a few aches today to remind of the effort required !!! David and Rachel had arranged accommodation at the Benwiskin Centre, Ballintrillick, County Sligo for 18 members of the club to enjoy a weekend of walking in the area. The Benwiskin Centre is a 28 bed Holiday Hostel and Self Catering Accommodation Centre in the rural village of Ballintrillick, approx 5 miles from Mullaghmore, one of the 'Signature Discovery Points' on the Wild Atlantic Way's long distance touring route. The Centre is located in a beautiful scenic rural location in the shadow of Benwiskin Mountain, part of Ireland's Dartry Mountain range, with the only tabletop mountain in Europe, Benbulben, within eye view. Gore-Booth family and regular haunt of W.B. Yeats. We ended our activities here with coffee. Corglass where we turned west and followed the top of the escarpment towards Kings mountain. We had reasonably clear views of the surrounding hills and lowlands and the lakes and sea beyond and could make out the object of Saturday's walk - Lissadell in the distance. We descended a twisting path back to the valley - well pleased with our day's walking. Restaurant in the nearby small town of Grange. We ended our trip on Monday with either a walk at Eagle Rock or a cycle to Mullaghmore with it's beautiful harbour and brooding Classiebawn House on the horizon. Thanks to Rachel and David's organisation and planning, a great weekend was enjoyed by everyone. A group of twelve Spartans travelled over for a week of walking in the Lakeland Fells - staying in a little converted fisherman's cottage - Dolphin Cottage - in the small coastal village of Flookburgh on Morecambe Bay. The largest town was Grange-over-Sands and we were close to the picturesque medieval village of Cartmel - home to a beautiful Norman Priory. ... and famous for it's sticky toffee puddings!! We were lucky for the week to be blessed with a high pressure system that brought sunny, bright days with no rain. On our last night, we dined in The Pheasant Inn, Allithwaite before returning home via the Cairnryan to Belfast Ferry. Having consulted the ever reliable yr.no Norwegian weather website for the Mournes, our leader Henry Bowman was quietly confident that our walk would not be marred by rain and despite the gloomy BBC NI forecast, it turned out that he was correct, although we did encounter one very short burst of hail. Apart from that, it was dry and sunny, albeit with a stiff breeze, and after the heavy overnight rain, the visibility over the white-capped peaks and beyond was magnificent. Our rendezvous was at Meelmore Lodge car park where SRS groups qualify for a £1 discount on the usual parking fee of £4.50. With nine walkers in evidence, we organised ourselves into two cars and drove to Deer's Meadow car park, which turned out to be that layby just beyond Spelga Dam. From there we hit the ground running and it was a steep but steady ascent up the flank of Muck (674m), with Henry reassuring us this was the steepest climb of the day. At the top we paused to admire the scenery and partake of a brief refreshment stop. From there we followed the Mourne Wall north, along what Henry calls the central ridge of the Mournes. After a brief descent it was upwards again to Carn Mountain (588m), and on over to Slieve Loughshanagh (619m), down to the coll and then up again, this time a fairly stiff ascent, to Slieve Meelbeg (708m) where we stopped for a well deserved lunch. hut at the summit reminded us that the construction of the Mourne Wall has extended from 1904 until 1922. The stone mantle of the hut was inscribed with 1921 - a centenary looming! The most tricky piece of walking of the day proved to be the descent from Meelmore to the coll with Bearnagh, with the agile Henry leading the way and nimbly bouncing from rock to rock as the rest of us descended more gingerly. After a pause at the coll, Henry announced to widespread relief that the climbing was over for the day, and that we would return to Meelmore Lodge by means of a further descent to the Trassey track and then contour our way round the lower slopes of Spellack. observed, we had clocked up one peak per hour. Over apple pie and coffee in the Meelmore Lodge cafe we established that Henry's pedometer suggested he had covered 13km, but he did fit in a few extra excursions in order to get all those master shots, so perhaps 12km might be more representative. A splendid day out, with great company and good chat, and with the wind and sun on our backs throughout. Many thanks to Henry for organising and leading with such confidence and encouragement. And the secret of his athleticism, by common consent, why it was all down to something called youthfulness, which some of us have left long behind. Thanks to Henry for being so patient and keeping us all on the straight and narrow. The distance covered was just over 13km. The rain of Friday night and early Saturday had given way to a wonderful early Spring day - not as breezy as forecast and with an odd shower and plenty of bright sky in the beginning of the walk. A group of around a dozen met in Kilbroney Park and then consolidated to drive to an area that I had never been to before - marked on the map as Carmeen. We climbed to the trig point at 361 metres - where it was definitely breezy but with excellent views all around. We came out onto a small road and walked NE before turning S up a track and onto the side of Gruggandoo (that's what it says on this map!!!) - where we had a lunch stop before beginning our walk down the ridge of Wee Roosley, Slieve Roosley and Leckan More. Rain was forecast for the evening and as we descended to Ballymoney Wood on the edge of Rostrevor we could sense the change of weather - which luckily for us did not arrive until we were enjoying a cuppa in The Kilbroney Centre at the end of a delightful day's walking. There were 18 members on the walk from Dunnywater entrance and along to Rourke's Park and around and above the quarry to Round Seefin. At Long Seefin we had a little rest and enjoyed the beautiful sunshine and views across the Annalong Valley. Our steepest climb of the day was to the top of Rocky where we enjoyed lunch in the sunshine. Certainly the sunniest day of the year. We then descended to join the wall and followed it to The Bog of Donard. After following the Brandy Pad for a few minutes we turned south and parralled the Annalong Buttress down to Hares Castle and our second lunch stop. Our return to our cars was via the Dunnywater Wood. Fortified by our elevenses at the excellent National Trust Barn Cafe (claim to fame – the highest coffee house in Ireland at 1,025 ft) a party of 17 Spartan Red Sox set forth to sample the delights of the recently opened Divis Ridge trail on Saturday February 21. We were armed not just with the National Trust trail map but also with copies of a detailed map provided by Stephen Gilmore and produced by Active Belfast in conjunction with the Trust which marked the contours, the summits and the river sources. With a strong north-westerly breeze blowing, the mist came and went and as we crossed the newly constructed footbridge across the Colin River, we were engulfed in a storm of sleet and snow. Mercifully this cleared and we continued to follow the path, a combination of stone slabs and gravelly stretches, all excellent footing. Even on such an uninviting morning there were quite a few walkers, joggers and family groups coming the other way. Evidently word has spread about the wonders to behold on the Divis Ridge. The appeal to all ages was evidenced by a National Trust members’ families day out in which wardens had taken a determined group of mums, dads and young children off on a nature trail. The youngest was a baby in a pram, a strange looking sight on the moorland. That afternoon they were bound for a look at the archaeological delights of Divis and its bronze age settlements and they seemed undeterred by the freshening wind. And neither were we. As we followed the contour round, the mist cleared and we obtained our first glimpses down over Belfast and beyond. The drilling platform lying in the shadow of Samson and Golliath at Queen’s Island looked like a toy, while further afield we could see Scrabo, Strangford and an outljne of the Isle of Man. At the Black Mountain trig point we paused but it was too windy for an early lunch so we turned into the breeze and then took shelter at a bank at the side of the tarred road leading up to the summit of Divis Mountain (413m). Happily the mist had cleared and the sun came out as we partook of our lunch and savoured the views down Belfast Lough and across the city (see Stephen McBride’s excellent photograph). From there it was a stiff climb up to the summit, festooned as it is with communication masts which are surrounded by a wire fence – which itself looked rather dramatic as the snow had been blasted onto the diamond shapes of the fencing. After a short stop, we veered right and successfully found the path leading down the other side. Half way down we paused to inspect a viewpoint, but sadly with mist shrouding the hillside there was no chance of seeing the promised evening sun glinting off Lough Neagh. Here the Summit Trail joined the Heath Trail trail, which itself leads over more boggy ground skirting around the north-western flank of Divis and joining in again the northern end of the Summit Trail. Down the hill we walked, then taking a sharp right to cover the Lough Trail, which does a loop around the Bronze Age homestead, ultimately bringing us back to the café where we relaxed over a well-deserved cuppa along with a scone before most people decided they would call it a day. For some it had been a first foray on Divis and everyone was well impressed by the walking potential. That was the end of the official walk but not, however, the complete end of the day’s activities. The mist had cleared and although a chilly wind was still blowing, it was an entirely blue sky. The temptation was too much and a small group completed a circuit of the Heath Trail, finishing up at around 4pm at which stage the temptation of apple pie and cream proved irresistible. This must surely be the first occasion on which a Saturday walk has involved not one but three visits to the same café. A decidedly decadent trend. With just a hint of apprehension [from me anyway] twelve of us headed up from Bloody Bridge in bright sunshine and strong northerly winds. From below, the Mournes looked magnificent in its winter coat of snow and ice. making good time along the Miners track we eventually reached the mine and a Spartan tea break. With wooley hats pulled well down we entered the snowline and reached the wall and saw a truly magical sight before us. We all agreed that this could easily be the Alps or the Himalayas, [well, it could!!!] Sammy recorded on his latest gadget windspeeds of nearly 60mph - thankfully on our backs as we headed up Chimney Rock in a snow shower. As we walked the ridge along Chimney Rock to Slievenagarragh in late January sunshine the views all around where just stunning. Heading back down was also exhilarating as we all enjoyed crossing deep snowfields before meeting up again with the Miners track and back down to Bloody Bridge. We all agreed that today, thanks to the snow, had been a good one. Seventeen Spartans turned out for the walk which started at Donard car park Newcastle. When we arrived in Newcastle there was a cool chilly wind, so we didn't waist much time getting geared up. The route took us through Donard woods to Shepherds Lodge, where we made our way across the open ground to enter Tollymore forest. Keeping to the top track past the Drinns, we stopped for a break before leaving the forest. When we where about 100 mtrs short of the bend in the track at The white plains, we went over the stile in the wall and began our climb of Slievenabrock. We had to endure a cool sharp wind coming from the west as we climbed, so we kept going ,passing the knoll with the two large boulders on its summit. these two boulders could be seen quite clearly from the forest track and are a feature of this little knoll. Its interesting to see that Harvey Map of the Mournes has these two large boulders marked on the map. I stopped to take a photo of the first boulder and that's when I noticed the two memorial plaques screwed unto the boulder in memory of, JIM BROWN, AND WESLEY FRAYERS. the Quarry we followed the Granite Trail down and back through the forest to the car park. This turned out to be around an eight mile round walk. 10 hardened walkers gathered at Windy Gap for the Slieve Croob Walk. It was cold with snow flurries.We walked along the lonan to Leganney Dolmen in sunshine only to be hit by a snow blizzard when we thought of a coffee stop. As a result we moved on a bit further to have our stop in shelter near a ruined cottage. Next we climbed Slieve Leganney with great views of the Mourne Range. Lunch was at the bottom of Slieve Croob in another snow shower. Gerrard and Jack sat in a shelter tent! Next up Slieve Croob which was very windy on top and then back along the ridge to Seeconnell. We did the walk in 4 .5 hours a record I think! A large group of Spartans turned up at Meelmore Lodge to start the New Year with a walk up Commedagh. As we stood in the carpark looking at the low lying mist we wondered if we were wise but Henry reliably informed us that the mist was going to lift in about an hours time and so we proceeded to walk towards the 'green lane' and on up Slievenaglogh. We had our first lunch here on the other side of the stile where we were quite sheltered from a chilly wind. We then proceeded to continue up towards Slieve Corragh protected by the wall. It was at this point that we heard the first of Henry's WOWs - the mist had briefly lifted to reveal the top of Bearnagh sitting above the clouds and it certainly was a WOW moment. As we progressed up Corragh we started to notice the first patches of snow and the higher we got then the heavier the snow. The mist was continuing to tease us by lifting to reveal another marvellous view and then closing in again. but we still had a bit of walking to do before it got dark. We made our way down to the Col between Commedagh and Donard before joining the brandy pad which led us back round to Hares Gap and then down to Trassey and back to Meelmore. some of those festive calories - the weather certainly played its part and thankfully despite a few Spartans having a tumble or two we all made it back to ours cars safely just as the nearly full moon rose brightly in the sky.